The word Zarzuela is Spanish for a particular kind of light or comic opera which includes operatic sequences, popular songs and dance - a light hearted mixture. It is also the name given to a composite Spanish fish stew containing a mixture of different seafood ingredients. It can be made with a variety of different fishes such as bream, hake, monkfish, seabass or with shellfish or a mixture of both. On this occasion we decided to make one without fish using squid, mussels, clams and prawns. It's comparator in France would be bouillabaisse. It is also be similar to cioppino - a dish originating in San Francisco from the American-Italian community but owing its origins to various regional seafood dishes from Italy. 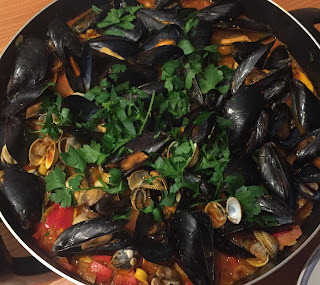 Zarzuela is, however, a more rustic dish than bouillabaise or cioppino - heavier and richer - due to the addition of serrano ham (or, in some recipes, chorizo) and ground almonds to thicken and flavour the sauce. The quantities given here are for two very generous portions but could feed three as a main course or provide four large or six smaller starters. Peel the prawns, reserving the heads and shells for stock. Remove the black intestinal track and set aside the prepared prawns. For the stock, gently soften a small chopped onion in a little olive oil, add chopped garlic, chopped celery, add 750mls water or chicken or vegetable stock and a bay leaf, bring to the boil and gently simmer for 20-30 mins than strain and set aside. Clean the squid, or ask your fishmonger to do it, but it is comparatively easy to do yourself. Pull the head and it should come away with all the intestines. Remove the plastic-like quill from inside the tube. Cut the tentacles from the head just above the eyes and remove the hard beak. You can then separate the tentacles into 4 pieces and set aside. ......then remove the skin. Just rub the tube and the skin will pull away easily and can be discarded. The wings can then be pulled off easily. They can be chopped or sliced and the tube can be cut into rings. Dust the squid rings, tentacles and wings with flour that has been seasoned with black pepper and half teaspoon of cayenne pepper. Shake off excess flour and gently fry for a few minutes and set aside. Rinse the mussels and clams in running water and debeard the mussels. Throw away any that do not close or have broken shells. Blend the almonds in a blender/coffee grinder to a granular texture like breadcrumbs. If you blend them too fine they will be very greasy. Finely chop or mince the onion and fry gently to soften without browning in a large pan with a lid or casserole a dish. Add the chopped garlic and then the chopped serrano ham and fry gently for a few minutes. Add the chopped red pepper and chopped red chilli and continue cooking gently until the pepper has softened. ....and continue frying gently for two minutes, turning the prawns until they colour a little. Add the white wine infused with saffron and the bay leaf, thyme & chopped rosemary leaves and bring to the boil. Add the tomatoes and when the mixture reaches boiling, add the mussels and clams. 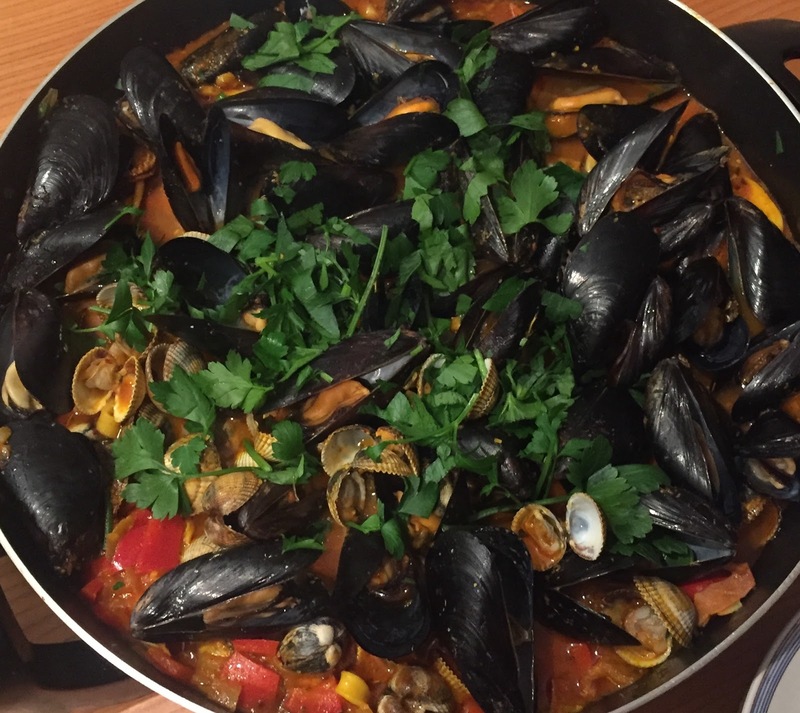 Turn down the heat, place a lid on top and simmer gently until the mussels and clams have opened. ........and serve with fresh crusty bread. *If you want more "heat" add extra chilli during cooking or use hot paprika (pimentón picante) as well as or instead of pimentón dulce.